Stepping into the White House Rose Garden on a mild sunny day, Vice President Joe Biden announced that he would not join the 2016 presidential race because he had simply run out of time. Flanked by President Barack Obama and Jill Biden, his wife, the vice president explained that since May 30, when his 46-year-old son, Beau, died of brain cancer, he and his family have been working through their grief. Biden has run twice before for president; he has a national and international reputation for political and governmental expertise. He vowed to continue to press for support for President Obama’s policies, to urge divided factions in the U.S. Congress to unite, and to return to “one America” - a national consensus on key issues. The 72-year-old former senator from Delaware joked about some reporters' informal references to him as "middle-class Joe," a label he wears proudly. He defended President Obama’s efforts to improve life for America’s middle class and declared the current economic inequality between rich and poor Americans unsustainable. Turning to international affairs, the vice president said the U.S. has learned much about “large-scale, open-ended military invasions,” and must accept that it cannot solve the world’s problems alone. Biden's announcement ended months of speculation about whether he would return to electoral politics for one last campaign. By abandoning a presidential campaign before he even entered it, Biden clarified the status of his fellow Democrats' candidacies. 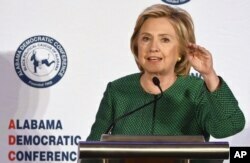 Democratic presidential candidate Hillary Rodham Clinton speaks during a meeting of the Alabama Democratic Conference in Hoover, Ala., Oct. 17, 2015. Former Secretary of State Hillary Clinton is the current frontrunner, with Vermont Senator Bernie Sanders well behind her in second place. The vice president urged them and other Democratic hopefuls to defend the Obama administration in their political campaigns and to run on the president's record, promising to continue and expand his policies. "Joe Biden is a good man and a great vice president," Clinton said. She added that during his years serving beside President Obama through "every pivotal political decision," the vice president compiled “a record to be proud of [and] defend." "Serving alongside him in the Senate and then [in] the administration," Clinton said in a statement, "I saw first-hand his passion for our country and our people. Like millions of others, I admire his devotion to family, his grace in grief, his grit and determination on behalf of the middle class, and his unyielding faith in America’s promise." In a comment on Twitter, Sanders expressed his thanks to the vice president "for his continued service to the nation and his support of the middle class." The Republican front-runner in the presidential race - still more than 12 months away - is Donald Trump. He reacted to Biden's announcement through his account on Twitter (@realDonaldTrump), tacking on a partisan comment about Hillary Clinton. Democratic Senator Chuck Schumer of New York praised the vice president's "long, distinguished, effective career." Schumer added, "when someone goes through what he went through, with the awful tragedy, everyone has sympathy for him. ... I am glad he is going to continue to stay active in the public arena."